Frank Lloyd Wright’s vision for what a home should be wasn’t just about aesthetics, he believed that affordable, well-designed residences could make for happier people, and a better society overall. 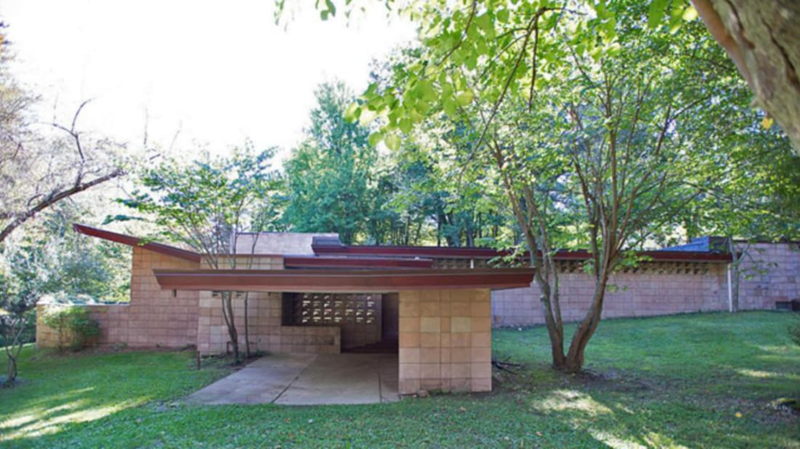 This so-called “Usonian” style is showcased in about 60 homes designed by Wright from the mid 1930s to the late ‘50s. One of them is for sale right now, and selling for a cool $445,000—the lowest asking value for a Wright design on the market. The Eppstein House in Galesburg, Michigan is a ranch-style home that was built in 1953 for Samuel and Dorothy Eppstein, a couple who worked at The Upjohn Company (a pharmaceutical manufacturing firm) in nearby Kalamazoo. In the late ‘40s, a group of 12 scientists from the labs had asked Wright to design a community of Usonian homes for them to live in. Wright’s philosophy was well-aligned with that of Upjohn, a company that was known for providing good benefits and fostering happy, healthy lives for its employees. The original plan for “Galesburg County Homes Acres” (now known as just “The Acres”) contained 22 homes, meant to be specifically designed for the future inhabitants—they intended to build them with little or no outside help—but only four were ultimately constructed. The Eppstein House is 2250 square feet, and contains three bedrooms, two baths, two fireplaces, and two living rooms. There’s also a pool, private pond, and access to the neighborhood’s 70 acres of private rolling wooded land (the house was designed to integrate naturally with its surroundings). It’s also registered on the National Register of Historic Places, and the Frank Lloyd Wright Conservancy. The property underwent extensive renovations under the previous owner and is 95 percent done, realtor Fred Taber told Realtor.com. To find out more (or just bask in those real estate dreams), visit Jaqua Realtors. All images courtesy of Jaqua Realtors.